Gwendolyn is still very much dealing with how to survive as a zombie. In order to ensure that she retains her memories, Gwendolyn must consume a brain a month. For some reason however bodies are being stolen from the morgue leaving poor Gwen hungry. This is a problem because unless Gwen feeds regularly, she starts to lose memories from her life. Already, interactions with her mother when she was a little girl have begun to become fuzzy. When she finally does get a brain, it's from a woman who wants to reconcile with her daughter. Proving that Gwen has absolutely no luck, the young woman who her new brain wants to reconcile with just happens to be a girl she went to school with. uVampire doesn't really do much to advance the meta of the story despite introducing us to a few new characters. 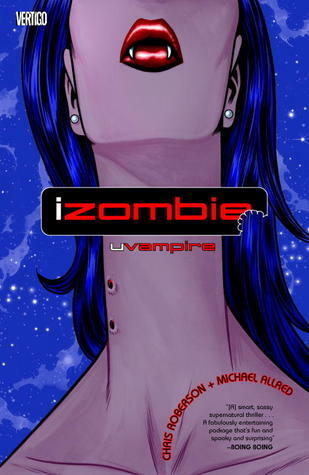 What uVampire does do is offer up some back story on the characters that we met in volume one. In Dead to the World, we met Gwen's friend Scott/Spot the were-terrier, who is possessed by the the under soul of a dead terrier. In this volume we get a bit of Scott/Spot's backstory. Scott/Spot was raised by his grandfather after his parents died in a crash. Though the two were close when he as a child, a rift grew between them as Scott/Spot began to age and refused to give up his love of the fantastical. After Scott/Spot graduated they went their separate ways until Scott/Spot got a call to inform him that his grandfather was dying. Scott/Spot told him the truth about what he is not but his grandfather believed that he had actually lost his mind. It's only when Scott's grandfather died and he came back as a chimp of all things that he realised that there was something to what Scott/Spot had been saying.This however did not stop Marvin from constantly pushing Scott/Spot to go out and meet a girl. Scott's life is pretty generic. He hangs out with his friends at comic book shops, they play board games and or video games. He is clearly in love with Gwen but has been friend zoned. I do however like that he is respectful and is just happy to be Gwen's friend. What does irk me about Scott/Spot is that he doesn't ever stand up to his friends homophobic comments. When Scott/Spot runs into Gavin at a local comic book store, the two strike up a conversation and Gavin writes his phone number on Scott's hand. This is enough for Ashook to say, "seriously Scott. You are TOTALLY Gay. Just ADMIT IT." Where the hell did this even come from? How does this even make sense? How else are you supposed to get back in touch with a stranger when you just happen to click? Thanks to Marvin taking up residence at Scott's, he is unable to have his friends over for a month. Vincent suggests that the reason Scott/Spot doesn't want them there is because he has to hide his burgeoning gay magazine collection. Again, what the hell was the point of this ridiculous homophobia? Roberson couldn't be arsed to include a gay character but somehow, he could find time for a homophobic snark. Yeah none of that is the least bit okay. We also get Ellie's backstory and it is incredibly sad. Her father was extremely over protective and made his life all about her. As a child, Ellie was never allowed to do anything remotely dangerous. When she reached young adulthood and wanted to leave Eugene for college, her father expressly forbid it. Because Ellie dreamed of seeing the world she decided to leave and got hit by a car crossing the street in front of a bus station. This means that Ellie, who always wanted to travel, is now permanently stuck in Eugene because a ghost has to have a memory of a different place in order to visit it. After a visit to Amon, Ellie learns that she can possess the body of the living and the first things she does is take a man's body and then physically accost Spot/Scott in the street. Really? Yeah, accosting Scott/Spot and asking him for a kiss is played for humour but it's not the least bit amusing. As part of Ellie's backstory we get to see her hanging out with other ghosts at the graveyard. The ghosts there are diverse and they tell stories from their lives as entertainment. Mary Howard ended up in the graveyard because this is where her fishing village was when she was a child. Not only does she tell a story from her people, she's very vocal about the way the Europeans destroyed her way of life. This message is then countered by a story by Smitty who calls, Mary's story "red man mumbojumbo" His story is all about "chinamen" who "shanghai" white people in the tunnels under Portland. The story is actually true however his telling of it is racist. Thankfully, Smitty gets called out forcefully. Gwen has been starving because someone has been stealing the bodies from the morgue. This presents a real problem because if Gwen doesn't eat brains she looses her own memories. Amon warns her that she has already forgotten so much than she realises. Gwen does manage to luck into the brain of Marion Nakagawa, her childhood neighbour. Marion is desperate to reconcile with her daughter Trisha. Marion has issues because Trisha's father bailed the moment he found out that she was pregnant. When Trisha got a boyfriend, Marion immediately went all Tiger Mom, claiming that Francisco would never be good enough for her daughter. This really could have used a more nuanced portrayal. Other than staving off her hunger, eating Marion's brain causes Gwen to remember that she has a brother. The scenes of Gwen talking about her childhood and how it's all fuzzy and fading away are really touching and in fact very much humanise Gwen. When Gwen starts stalking her brother, wondering if she should let him know that she is a zombie, it's absolutely heart breaking. It made me think about just how important our memories good or bad are. It's our past that makes us who we are. I really look forward to seeing which way this is going. If finding out how much she has lost is not enough, Gwen seems to be falling for a monster hunter who has no idea that he is dating a zombie. I'm not convinced that the romance angle is necessary for the story, particularly given that Amon. the mummy is trying to stop Galetia, who is trying to usher in an evil being into the world. It's all connected to Marion and Trisha because Galetia has kidnapped Francisco. Clearly, what Galetia is doing is something Gwen is going to have to try to thwart and I think that it's all going to me too much for her to focus on. If that were not enough, the vampires decide to inform the Diogenes and Horatio that there are zombies they should be focusing on.